If, like me, you live in the South East of England you’ll know that house prices are still unreasonably high when you compare them to average salaries. Conversely mortgage payments are at an all time low since the Bank of England base rate was dropped to 0.5% back in 2009 and even further to 0.25% in 2016. So for those already with a mortgage that’s good news but for the majority of young people yet to own their own new home low interest rates on home loans is no consolation because they can’t get a large enough mortgage to buy a home of their own in the first place. Lenders’ strict affordability rules and high house prices have been conspiring for the past few years to keep many of us renting for longer than previous generations. We are also taking out higher levels of debt on credit cards and car loans (ouch – I’m worried about my credit score! )I’m not necessarily knocking that as renting is, in many ways, a more carefree existence (even though there is a level of insecurity). No maintenance or repairs to worry about; no worrying about the cost of a broken down boiler or a storm causing damage to the roof – things that all happened in my previous rented place. But finally, the realization that I was effectively paying someone else’s mortgage while house prices continued to rise and actually paying more than the cost of a mortgage for my apartment, drove me to have another go at finding somewhere to call my own and I ended up moving to Buckinghamshire – much to my surprise. 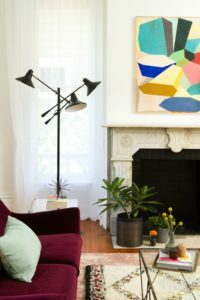 House hunting can be so dis-heartening when you can barely afford the cheapest place on the market – I’m sure it’s not easy even if you have plenty of cash to spend on a new home but I found it particularly hard when rightmove didn’t come up with a single place for my budget in my preferred area. So, like so many house hunters before me I decided to widen my search area – love that map search on rightmove when you can just outline the area you are interested in and cut out even groups of roads that are not suitable – give it a try! I started first by widening my net by about 3 miles to the north and that at least returned some homes for my search but kept me close to my comfort zone and, more importantly just 2 stops further out on the train I need for occasional forays into London. And I very nearly secured a great little 2-up 2-down Victorian cottage but another buying offered over the asking price and I lost it. (Yes, really, that’s what it’s like here – people are offering more even than the estate agent thinks it’s worth – go figure). So I gradually started inching out another mile or 2 and found myself in a new county with a completely different train line to London but still one that had a reasonable commuting distance and time. More importantly prices were noticeably cheaper. It was a town I knew and it’s southern edges were not exactly in my comfort zone but definitely worth a look. 6 months on I moved into my very own new home – a bijou Victorian cottage – it’s decoration is pretty awful but it’s a good solid house with a pretty little garden, and most of it’s period features in tact. Small but perfectly formed. Yep – same problem here in Devon (which I’m sure is cheaper than the South East but still beyond my reach. You are very fortunate to have been able to buy your own place in your early 30’s. I guess working in London means higher salaries than down here in Exeter but I don;t think I could ever tear myself away too far from the coast – that’s my comfort zone. I once nearly moved to Devon – further south than you near Salcombe but in the end the (slightly) cheaper homes didn’t make up for the loss of income. But at least you have a far nicer journey into Exeter than I have on the Chiltern line whe I need to get to London. Keep looking though – there are all sorts of interesting properties out there if you do push yourself beyond your comfort zone and are prepared to take on a challenge. Lucky you – I also live in the South East and at this rate I don’t think I will ever be able to afford my own place – you know the problem. I can’t save for a deposit while paying rent but ironically I’m paying rent which is higher than the mortgage would be for a similar apartment.